It’s a problem that most of us parents know all too well. Your kids are constantly saying “I’m bored” and “There’s nothing to do,” while you look around the house and see an overwhelming amount of toys, games, books and art supplies. Although parents and grandparents mean well, most kids have way too many toys and games and are not only overwhelmed, but also have a passive relationship with their things expecting their toys to entertain them instead of them active playing with their toys. This prevalent problem is leading many families to take a minimalistic approach to toys and games striving to focus on quality versus quantity in an attempt to declutter their houses. Here are five simple steps to help parents conquer the clutter and pare down the excess of toys and games to ones that enrich your lives. While many parents will quickly agree that their kids have too much stuff, they often fail to recognize that they are setting the lead for this with their own amount of possessions. The first step for parents is to be a good model for your kids by minimizing your things. Most of our houses are stuffed with full closets, packed toy rooms and brimming cabinets. Even when we don’t realize it, our kids are watching us when we constantly order off of Amazon or fill the shopping cart at Target. We are teaching them that acquiring more stuff makes us happy, when actually more sometimes can be worse. As good role models, we need to teach them healthy boundaries in the regards to the things we own by making a resolution to own less stuff and be grateful for the things that we do have. Look online for a declutter challenge such as the 30-day declutter challenge. By minimizing your possessions and decluttering your life, you will experience less stress and burden of clutter, and more money and time for the things that really matter to your family. In addition, by donating unused items, you will be teaching your child compassion, generosity and gratitude. In the long run, your children will learn the importance of moderation, financial responsibility and gratitude from you. And, all of this should start in your closet, not theirs. The next step involves working with your child to pare down their belongings to the things that matter the most to them. According to research, children who play in environments with less toys tend to be more focused, imaginative and perceptive. In other words, too many toys and games actually prevent kids from being creative and shorten their attention spans. In addition, kids with less toys learn how to develop better social skills with other kids and adults and learn how to take better care of the things they have. Are you convinced yet? If so, it’s time take a long weekend or every other Saturday to weed through their playrooms and closets and simplify. Start by helping them make a trash pile for broken toys or games with missing parts. Then, make a donation pile for duplicate games or toys that they have outgrown. Keep their favorite toys and any classics that you might want to save for later. Last, find a way to organize the toys that you keep in a way that will be easy for them to manage. You will all be surprised by how much you enjoy having less stuff and engaging more deeply with the things that are the most meaningful. The easiest way to prevent a life of overwhelming clutter is simply to buy less stuff. Recent research shows that in the United States, the average ten-year old child owns approximately 250 toys each and the average parents will spend an additional $500 per child on new toys each year. However, most children only play with the same ten to twelve toys on a daily basis. Now is the time to start limiting your toy intake. Start by making “please no gift” requests for any birthday parties you plan for your child. Then, set moderate limits at the holidays. If well-meaning family members want to buy your kids presents, prepare a short gift list with a few solid things that you know your child will really like. Or, instead of toys and games, ask that they consider purchasing gift cards to an event or activity that they can experience together like a membership to the zoo or movie tickets. Click here for a list of more non-toy gifts. Because you never know what kids will like from week to week, you definitely don’t want to get rid of everything. They may decide next week that they want to play with the cars that they didn’t care about last week. Keep toys choices fresh and interesting by storing some in plastic bins out of sight and then rotating them in the mix. This will keep your child from being overwhelmed by too many toys or games at once and also keep them engaged with the ones that are accessible. When you bring toys back in the rotation, they will feel like there is something exciting and new to play with. Be sure to keep their very favorite toys out all of the time instead of in rotation so that they don’t feel like they are missing them. You can also rotate toys on a seasonal basis so that the legos that are fun to play with on a cold winter day are out of the way in the summer when the outdoor games are out and ready to use. Along with this, encourage your child to help clean up one set of toys before they get out another. This will help keep things organized and help keep them from being overwhelmed. Most importantly, choose your games and toys wisely. Every parent wants their children to be happy and have things that enrich their lives. Instead of giving them the latest flashy toy, search for toys that develop their imagination and creativity and classic games that promote teamwork and strategy. Growing minds need toys and games that will grow with them like building toys, role play costumes, action figures and games for teaching social skills and sportsmanship. Starlux Games offers games that are a lot of action for a small amount of shelf space, plus they are great ways to be creative, active and socially interactive. All of their games involve multiple play variations keeping the games fresh and still exciting as kids mature. Their game CAPTURE THE FLAG REDUX is the classic game revolutionized with glow-in-the-dark LED lights. Kids will love the glowing nighttime excitement and parents will love the fact that their kids are learning teamwork and strategy. GLOW BATTLE is a an active glow-in-the-dark battle game that is a wonderful way to build social and creative thinking skills. Both are available here. The featured image in this post is by U.S. Air Force photo by Airman 1st Class Diana M. Cossaboom and can be found here. Throughout all of time, the teenage years have been awkward ones for social interaction. But today’s teens face even more barriers when it comes to good social skills. Teenagers spend so much of their time on phones or electronic devices that it seems many of them don’t know how to handle normal social situations such as meeting new people, having a conversation or just hanging out with friends. All you have to do is look around a group of teens to see them all texting on their phones or on social media instead of interacting with each other. In a high-tech world that limits face-to-face interaction, here are a few ideas to help parents teach their teens valuable social skills like how to positively interact with others and build healthy relationships. Even when you don’t realize it, your teens are watching you and leaning. That means that what you do is often more important than what you say. It’s up to the parents to consistently model positive social interaction. When you act kind to neighbors, smile at strangers and treat others with respect, your kids are watching you and learning. When you listen to people without interrupting, show interest in a conversation and make small talk to be friendly, they are watching. And, when you avoid gossip, look for the good in others and try to make the best out of a negative situation, they are learning. When you model all of these things for your children, you are teaching them that other people are important and that being considerate is always right. Be sure you show respect to others you meet in little ways like listening to their side of the story, saying “please” and “thank you,” or offering your place in line. In addition, help your teen talk through peer problems with positivity and coach them through awkward situations with an optimistic view of others. When you do this, your teens will reflect your actions and attitude with a more positive approach toward social situations. Like everything in life, you can only get better at social interaction with practice. While your teens do learn from the actions you model, they also need to have plenty of social opportunities with their peers to practice them. Research shows that social interaction in teen years is important for both physical health and mental well-being. Social relationships help teens cope with the stress and pressure of teenage life. Encourage and support your teens’ friendships, and help them find activities that involve putting down their phones and connecting with these friends. The more opportunity they have to fosters these relationships, the better. Look for fun games for teenagers that they can play with their friends like Capture the Flag REDUX, an active and socially interactive outdoor adventure. It’s the classic Capture the Flag game revolutionized with futuristic glow-in-the-dark lights. Perfect for encouraging strategy and interaction, as players break teammates out of jail, sneak into enemy territory, protect base and steal the glowing flag to win. Each game box includes two glowing orbs to use as the “flags,” color-coded LED bracelets to differentiate team members, glowing jail markers, and a rulebook. As an extra bonus, each kit includes 12 game variation cards that offer even more ways to play Capture the Flag, as well as other games. Capture the Flag REDUX is available here. Studies show that team athletics are a good way to encourage social skills especially if parents use them to teach good sportsmanship. When you give your teen specific ways to practice good sportsmanship, they develop conflict-resolution and leadership skills. If your teen likes athletics, help them find a recreational or school sports team that they want to participate in like basketball, soccer, swimming or archery. Letting your teen join athletic teams lets them have social interaction with other teammates and gives you a chance to remind them of good ways to practice good sportsmanship before each game. These can include being a good winner or loser, respecting other teammates, as well as respecting the opposing players and the game officials. In addition to athletic teams, teenagers can learn social skills from other activities that teach teamwork such as games that require cooperation, leadership and decision making skills. These type of games require teens to discuss strategy and tactics and encourage compromise. 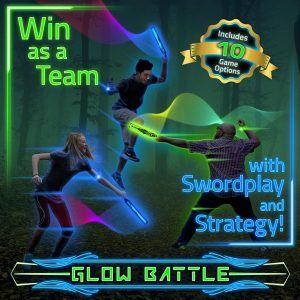 The game Glow Battle is a fun way to have healthy battles and release some of the energy and frustration that comes with being a teen. The game encourages players to use strategy, and teamwork to run and take down their opponent using harmless, glowing batons. Teams are designated by different colored LED bracelets and can be played anywhere that you have open space – inside in a dark room or outside after the sun goes down. It’s an exciting way to get active and foster social interaction. Good social skills for teens should include an openminded attitude to people that are different from themselves. Teens should be taught to imagine another person’s perspective and know that there is always more than one way to look at a situation. Aside from telling your teens this, there are also games that can help encourage this and reduce social biases. For example, the Awkward Moment Party Game requires players to find solutions to awkward social situations. The game includes Reaction cards and Decider cards. Players get dealt the Reaction cards that have them face awkward, embarrassing or stressful situations. Then, the one with the Decider cards gets to choose the best response from the players. It helps broaden perspective and reduce social biases. Another game that helps teens recognize and check their social biases is Buffalo The Name Dropping Game. It requires players to name real or fictional examples of people who fit a random combination of descriptors (like tattooed grandparent, misunderstood vampire, or skinny superhero). Both of these games are available at major retailers like Amazon or Walmart. If you are or ever have been a youth group leader, then you know how important it is to have a good arsenal of games to add to your youth ministry. No junior or senior high kids want to sit and listen to straight lessons or lectures all night. Getting them up and active is not only a good way to break up the lessons, but also a great way to build community within your youth group. Games can help youth get past some of the awkwardness, and find things that they have in common. When they start to feel more comfortable, they are more likely to share in group discussions. Since it’s somewhat of a challenge to find games that work for a variety of ages and personalities, here is a list of some simple games to get the fun started. With a little creativity, there are many tradition active games that you can adapt to include biblical lessons. For example, your youth group can play “Christians in the Catacombs” like the game of sardines or backwards hide and seek. Explain to your group how the first Christians used to meet in the catacombs and then slowly kept increasing in numbers. In this game, one person hides in a dark place and then the rest of the group searches for them. Once someone finds them, they join them in the hiding place until everyone is hiding except for the last player who is “it” for the next round. Or, they can play “Bible Smugglers” like sharks and minnows and you can explain to your group how some Christians risk their lives to smuggle bibles into certain countries. Give each player a glow bracelet as their bible and they must race from one end of the playing field to the other while the leaders try to catch them “smuggling” their bibles. Another fun activity is to divide into teams of 3 to 5 people and have a Bible Scavenger Hunt. Give each group a bible, a copy of the scavenger hunt questions and a pencil. They will also need a cell phone to take pictures. Each group then teams up to figure out the answers to the scavenger hunt questions. Once they know the answers, they race to take pictures of the different items in the answers. You can find a free printable worksheet here. When you need a game on the spot and don’t have a lot of time to prepare or gather equipment, the Tangled Chain Game is easy, simple, and so amusing. Have the entire group form a big circle and then one by one, grab a hand of someone on the other side of the circle. Then, let them weave in and out, and over and under until they are a big tangled mess of arms. Once everyone is connected, they must work together to find a way to untangle their chain. You can also divide into two groups and let the teams race to see who can untangle their group the fastest. It can be a really fun ice breaker, and encourages creative problem solving and teamwork. Part of youth ministry is teaching them how to handle challenges and battles in life. Glow Battle is an exciting way to have healthy battles and release some of the energy and frustration that comes with being a youth. Your group can play Glow Battle anywhere that you have open space – inside in a dark room or outside after the sun goes down. The game encourages players to use strategy, and teamwork to run and take down their opponent using harmless, glowing batons. Teams are designated by different colored LED bracelets. It’s a fun way to get active and build team bonding. You can purchase Glow Battle here. Another great team building activity that doesn’t require a lot of space or equipment is Bible Charades. Similar to regular charades, this version can be played in teams with either one person acting out bible characters while the rest of the team guesses, or a whole team acting out bible scenes while one of their teammates tries to guess. First divide the group into equal teams. Then each team writes down bible characters or scenes for the other team to act out and guess. Teams get points for the number that they guess correctly. It’s a smart idea for youth ministry teams to have a few board games on hand that are enjoyable as well as meaningful. For example, It’s All About That Grace is a hilarious game that teaches youth the lesson that God’s grace wins every time. The game includes 60 cards with seven deadly sin cards that are nearly impossible to avoid. The good news the grace card can save you from the sin every time. And, Apples to Apples Bible Edition is always fun and so easy to play, just open the box and deal the cards. Each round is filled with crazy comparisons of people, places and things from Christian history. When you feel like your group needs some encouragement to speak up, then Outburst-Bible Edition is the game to get them opening up. It includes entertaining and challenging bible topics such as “Animals in the Bible,” or “Names for Christ.” Players get 60 seconds to try and name as many of the key answers as possible. There are 252 topics included for hours of fun and laughter. Board games like these are available at major retailers like Walmart or Amazon. Because a lot of youth groups meet after school or in the evenings, it’s good to have a number of fun glow in the dark games that you can play after the sun goes down. Youth will want to play “Grog” simply because of the name alone. Take apart a flashlight and hide the pieces all around the playing area. One person in the “Grog” or evil monster that can freeze you when they tag you. The other players have to work together to hunt down the pieces of the flashlight, put it back together and shine it on the Grog. Together they learn that the “Light” defeats evil. A fun, glowing game for those that want to figuratively and literally want to follow the light is Save the Lost. This active Christian game involves hiding, searching, running and even sneaking up on people while teaching meaningful principles. Included in the game are 22 glowing LED games pieces and easy-to-follow illustrated instructions making it the perfect nighttime activity for all age youth groups. 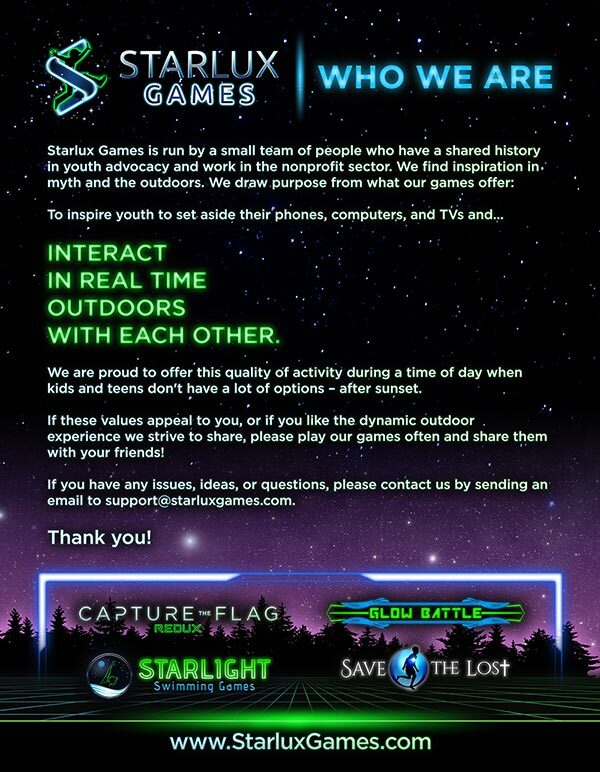 Starlux Games also makes another active nighttime adventure game that is great for youth groups. 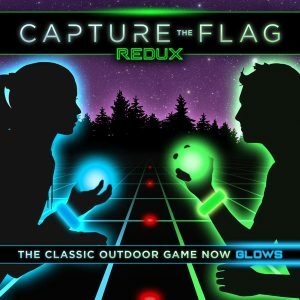 Capture the Flag REDUX is the classic Capture the Flag game revolutionized with futuristic glow in the dark lights. Split your youth group into teams and watch as they break teammates out of jail, sneak into enemy territory, protect base and steal the glowing flag to win. Each game box includes two glowing orbs to use as the “flags,” color-coded LED bracelets to differentiate team members, glowing jail markers, and a rulebook. You can purchase this game here. Middle school and high school parties can be awkward, and when you add both boys and girls to the mix, it can become a recipe for the perfect awkward storm. They either stand around in groups without talking to each other, or they get out their phones and all stand around looking at their individual devices. It’s hard to keep a big group of tweens and teens entertained especially if you don’t want them on their phones all night. They definitely don’t want to play cheesy games that make them even more uncomfortable. Be prepared for your next boy/girl party with this game list that lets them be active, mingle, practice their social skills and have a great time, too! The great thing about this game is that you can either play it inside or outside, and all you need is a sackful of blindfolds and a little preparation. Create an obstacle course in your backyard or a larger room with whatever you have on hand – pool noodles, hula hoops, chairs. Have the partygoers get into boy/girl pairs and blindfold one partner in each pair. Then, have the other player navigate their blindfolded partner across the course or through the room. Time the teams and the pair that gets through the course the fastest wins. 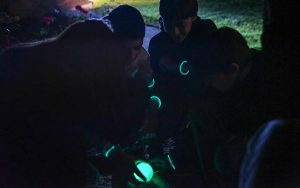 Because a lot of boy/girl parties happen after the sun goes down, Glow Battle is the ideal game to keep them outside and active in the evening. Players have to strategize and take down their opponents using harmless glowing batons. Physical activity becomes part of the fun as players run, jump and swing at each other to win. Available for purchase here at Starlux Games, each game box comes with 10 weapons, 10 glowing wristbands, 8 regeneration station markers and 10 game playing cards. Glow Battle can be played with 2 to 10 players and comes with different game variation cards that both boys and girls will love. Stack It is a really simply game that tackles the entertainment and the snack at the same time. Really any number of people can play and all you need is a big supply of chocolate sandwich cookies or some other sort of stackable cookies. Each player takes turns bending backwards and stacking as many sandwich cookies on their forehead as they can. They keep stacking as many as they can balance until the stack falls off. Then, the next person gets a turn. Keep track of which player can stack the most and they are the Chocolate Champion. To add some friendly competition, you can play as a relay race and divide into boys against girls. Have each player stacks two or three cookies and then race down to the next player on their team without dropping them until all of the players on their team have gone. Sometimes you just have to break out the electronics to get boys and girls to start interacting with each other and laughing. Catch Phrase is a hand-held electronic game that includes 5,000 words and phrases. Players pass the device around and try to describe the word or phrase on the screen to their teams without saying any part of the phrase. But they have to do it fast before the timer goes off. Categories include Fun and Games, Entertainment, Everyday Life, Variety, and The World. Every time you get caught holding the device when the buzzer goes off, the other team scores a point. The first team to reach 7 points wins. Cath Phrase is available at major retailers like Walmart or Amazon. This is a fun game to play once your boy/girl party starts getting a little warmed up. It pushes tweens and teens to get a little creative and out of their comfort zone. Two players stand up in front and other players shout out ideas for a funny scene like “buying a new tractor” or “lunch ladies in the cafeteria” and then the two have to start improvising the scene. Any time during the scene, someone from the audience can shout out “freeze” and the two performing have to freeze in the act. The person who yelled “freeze” taps the shoulder of one of them and replaces them up front. Then, someone else has to yell out a new situation or a change in the current situation. Keep playing until everyone has a turn or two as the performer. Because teens do love their electronic devices so much, they will have a definite connection with this party game. The objective is to create a tweet that is related to the selected #hashtag. You can be as funny and creative as you like. Players then get points for guessing who wrote each tweet, in addition to points for having the funniest tweet. Players can either respond traditionally on included sheets or text/instant message their responses on their cell phones. For four or more players and for ages 14 plus, #Hashtags is a fun party game to get the boys and girls really mixing at your next tween or teen party. This is a fun and simple game for all ages to play at either inside or outside parties. You will just need a good amount of space so that the players don’t bump into each other. Purchase a bag of different colored round balloons and blow them up. Then, divide the group into boy/girl pairs and give each pair a different colored balloon. The object of the game is so simple – each pair has to keep their balloon up as long as possible by blowing at it and not letting it touch the ground. The pair that keeps their balloon in the air the longest is the winner. 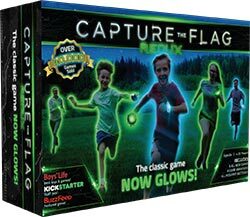 Because all aged boys and girls love to chase each other, they will love this Capture the Flag REDUX game that uses glow-in-the-dark LED lights. Each kit includes 25 battery-powered, reusable lights that transform playing fields and players into glowing teams of blue and green. Watch them get moving as they break teammates out of jail, sneak into enemy territory, protect base and steal the glowing flag to win. Complete with lit jail markers, territory lights, light-up wristbands and glowing crystals that serve as each team’s flag, this is game they will want to play over and over again. Plus, each game comes with 12 exciting game variation cards. Purchase the game here. Boy and girl groups love to play “truth or dare” and this is a fun way to let them play and still supervise it. Let your group write out some fun dares on small pieces of paper. Help them think of some fun, challenging dares that aren’t too embarrassing like eat a weird food combination or pull their socks off with their teeth. Then, insert each one into a balloon, blow it up and tie it off. Next, get your group of boys and girls to sit in a circle and take turns picking a balloon to pop. Then, they must do the dare or face the consequences. You will want to glance over the dares and the consequence to agree on ones that are safe and appropriate in your home. The featured image used in this post is a public image from Joint Base San Antonio and can be found here. It was a dark, cold and snowy evening. Does that sound like the start of a thrilling novel or like a long winter season home with your kids and stuck inside. Just because it’s snowy and cold out, doesn’t mean your kids can’t get outside for some active playtime. Don’t hate the wintery weather yet, just be prepared to bundle up your kids and gather supplies for fun outside winter activities. And, even if the days are shorter and it gets darker earlier, you can still find ways to incorporate some glowing ideas to brighten your winter evenings. 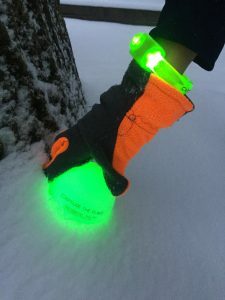 Kids and teens of all ages love things that glow in the dark and findings things that glow in the snow is really cool and makes playing outside when it gets dark earlier so exciting. Be prepared for dark, winter evenings with some glowing components like glow sticks, neon paint and glow in the dark games. And, the next time the flakes start falling, pull out these fun ideas for outdoor winter games and activities that can get your kids out of the house and have you actually looking forward to the winter months. A yard full of snow is like a blank white canvas just waiting to be painted. Pick up some neon paint and empty squirt bottles at the craft store and be ready for some snow day fun with an easy recipe for glow paint. Add one teaspoon of the neon paint to each squirt bottle and fill the rest with very warm water. Close up the bottles tightly and then shake them up until all of the paint is dissolved. You and your kids are now ready to paint and create glowing works of art on any snowy surface. For extra excitement, use a black light to reveal an even brighter glow. You can even bring some snow indoors in a plastic bin to make glowing rainbow snow with the neon paint. Once it’s dark and snowy out, you won’t believe how much fun glow sticks can be. Purchase them in bulk for mini treasure hunts and snow day activities. All ages will love to dig in the snow for the glowing treasures. Hide them in snowy flower pots, on snow-filled sidewalks and some in deeper snow drifts. You can use them to make snow-glow stick art patterns or tic tac toe boards in the snow. Playing with glow sticks in the snow will keep your kids busy and active outside and brighten up a dark, snowy evening. A snowy playing field can turn an old game into a new and exciting one. So, why not get out and play lawn games even when there is snow on the ground. Glow in the dark balls make flag football, wiffle ball and volleyball a winning winter wonderland. And, you can find glow-in-the-dark sets for corn hole, ring toss and lawn darts at Amazon and other major retailers. You can even make your own glowing lawn games with some fluorescent paint. Snow bocce and snow croquet suddenly become snocce and snoquet! And, some games like Capture the Flag REDUX are made for glow in the dark nighttime fun even in the snow. It’s the classic Capture the Flag game revolutionized with futuristic glow in the dark lights. Set the glowing jail markers on a snowy playing field and watch as players break teammates out of jail, sneak into enemy territory, protect base and steal the glowing flag to win. Each game box includes two glowing orbs to use as the “flags,” (see photo below) color-coded LED bracelets to differentiate team members, glowing jail markers, and a rulebook. Teams can even make snow forts as part of their territory or hide the glowing flag in the snow drifts. You can purchase Capture the Flag REDUX here. The thrill of tubing and sledding can only get better by adding some glowing elements. Grab some neon paint or glow sticks before you hit the hills and slopes in your neighborhood. Use the paint to outline a tubing course with swerves and curves. Add the glow sticks to your tubes and sleds as well as on your kids’ coats or boots. Not only will the glow make the winter sports more exciting, it will also keep your children safer by making them more visible to other sledders. When the snow gets deep enough, it’s the perfect time to freak out your neighbors with some creepy glowing snow creatures. Get creative and get glowing. Help your kids shape snowmen, snow women, snow animals or any kind of creatures and then use the neon snow paint to make really colorful characters. If you don’t want to break out the neon paint, then you can just make crazy creatures out of big lumps of snow and then use glow sticks for their eyes for a creepy effect. Kids and teens love to battle in the snow and the there is no reason that you can’t battle after the sun goes down. Plan a glow ball fight by mixing some of the neon paint with snow to make fluorescent snow balls. Or, you can insert mini glow sticks into the snowballs and launch them. You can also use a Glow Battle kit to play a number of battle games in the snow. Just find an open snowy space and break out the swords of light. It’s easy to set up and simple to play. Identify your teams with different colored glowing bracelets. Then, use strategy, teamwork, and warrior instincts to team up and take down your opponent. Use the harmless, glowing batons to attack your opponent, and send them running back to their base to “recharge” before they get hit again. Glowing snow battles are a great way to teach your kids strategy, encourage social interaction and keep your kids active in the long winter months. Do you know of any other fun glow in the dark games to play in the snow when it is dark outside? If yes, please let us know in the comment section below. When it comes to buying gifts for tweens, some folks might get a little nervous. After all, who even knows what a tween is or what is going on in their head. They’re not really kids anymore, and they’re not teens yet. They are in a vague place in between and that could make anyone a little confused about what they like and what they think is cool. So, if you’re wanting to wrap up something fun for them for the holidays, light up your tween’s life with one of these eight great glow in the dark gifts. They are far from boring and are guaranteed to distract them from their screens and phones for a while. It might make your shopping a little easier and help you gain some cool points with your favorite tween. It’s true, tweens loving lighting up the night. If they can put it on their body and it glows, then they are infatuated. Look for glow-in-the-dark gifts and LED lights that they can wear. There are colorful LED gloves that you can find at major retailers that are great for dance parties or sleepovers. You can also find clip-on shoe lights that tweens can use to be seen at night while running around the neighborhood. You can even find glow in the dark earrings and LED lights for your hair that they can use to make a bright entrance to any tween event. Contrary to popular belief, tweens still love nightlights – as long as they are cool ones. And, there are so many cool ones to choose from these days. There are gem stone nightlights, ones that are animal-themed and sports-themed, even a balloon dog nightlight. A current favorite is a 3D illusion lamp found on Amazon that creates an optical 3-D illusion and gives off a soft brightness that provides a dreamlike sleeping atmosphere perfect for tweens. They are available in all sorts of color-changing novelty themes like characters, guitars, sports and animals. There are so many fun glow games that Tweens will love. A crowd favorite is CAPTURE THE FLAG REDUX. It’s the classic Capture the Flag game revolutionized with futuristic glow in the dark lights. Let your tween invite over some friends and watch them get moving as they break teammates out of jail, sneak into enemy territory, protect base and steal the glowing flag to win. Each game box includes two glowing orbs to use as the “flags,” color-coded LED bracelets to differentiate team members, glowing jail markers, and a rulebook. As an extra bonus, each kit includes 12 game variation cards that offer even more ways to play Capture the Flag, as well as other games. You can purchase Capture the Flag REDUX here. Tweens like to be heard and sometimes it’s easier for them to spell it out on a message board like the popular new cinema light boxes. They are light marquee signs with interchangeable letters. And, now they come in glowing full color. These cool retro light boxes let your tween spell out fun messages for special occasions or just everyday thoughts. They are back-lit like a real marquee board and you can find all sizes and shapes here. While drones are cool, tweens will think an LED drone is even cooler. Enter the Geekercity Mini Flying RC Drone Helicopter Infrared Induction LED Remote Ball. It is a long name for a lot of fun! Switch it on and the colorful LED lights dazzle the whole place. Hold the ball in a straight position, wait a couple of seconds and it will begin to fly. It’s rechargeable, sturdy and easy to operate. It is motion-sensitive, so you can use your hand to control it while it’s in the air. Find it this holiday season on Amazon or other major retailers. There’s no doubt about the fact that tweens love to experiment. Give them something healthy and fun that they can experiment with like the SmartLab Toys Glow-in-the-Dark Lab. 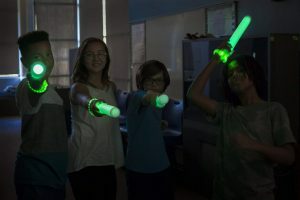 This unique kit allows tweens to discover the glowing world of luminescence, polymers, and chemistry as they make things like glow sticks, fluorescent ink, and lava lamps. Each kit comes with a “Glow for It” instruction book that includes 20 experiments, beaker, molds, a black-light activator, glow sticks, polymers for fake snow and bouncy balls, glow powder, fluorescent ink and more. Find it at Target, Walmart or Barnes and Noble this season. One of the best parts about being a tween is your ability to finally decide on your own room décor. It’s a great age to buy neon wall hangings and glow in the dark stars and stickers for their walls or ceilings. They are also sure to love string lights in all lengths and colors. One favorite is LED Battery Operated Fairy String Lights with clips for hanging photos, cards or artwork. Available at major retailers, these lights add a fun, sparkly glow to any tween room while giving them space to hang their personal pictures and notes without damaging the walls with tape and thumbtacks. It’s a glowing win for everyone! Tweens are sure to encounter battles, especially with their friends and siblings. Glow Battle is a fun and safe way to let them get their energy released. You can play Glow Battle inside in a dark room or outside after the sun goes down – anywhere that you have open space. Players use strategy, teamwork, and their own warrior instincts to team up and take down their opponent using harmless, glowing foam swords. Teams are designated by different colored LED bracelets have a base to “recharge” after they get. It’s a fun and glowing game that incorporates activity with strategy. Glow Battle is available for purchase here. Do you know of any other fun glow in the dark gifts that Tweens love? If yes, please share in the comment section below. Daylight Savings is coming to an end and the months of darker, longer nights are upon us. If you’re a parent, you may be in a panic about your kids’ sleeping patterns and outside play opportunities. Not only does the time change mess with your children’s sleep schedules, but they don’t seem to get enough outside activity to really wear them out. After all, by the time your kids get home from school, have a snack and do their homework, it’s already dark outside. If you plan ahead for these two things, you can easily transition your child schedules to include healthy sleep as well as healthy outdoor activities. Depending on your child’s age, start to slowly adjust his or her sleep schedule a few days or weeks before the DST shift. Even older kids and teens will need some encouragement to start adjusting their bedtimes by ten to fifteen minutes every few days before the time change. This can also be a good time to focus on better bedtime habits, like less screen time before bed to help their sleep quality. Since it will be lighter in the morning, make sure their windows have shades or curtains that you can pull to block the morning light for that extra hour of sleep if needed. It’s also a good idea to plan ahead to find exciting outside activities to play in the dark months ahead. Start by gathering a few fun games and basic supplies for the late fall and winter moths. Glow in the dark games, flashlights, glow sticks, neon duct tape, even head lamps are a great incentive for kids to get out and play no matter when the sun sets. Ensuring that your kids and teens get plenty of outside activity not only helps their physical and mental well-being, but it also helps them sleep better. All is takes to play this game is a pocket flashlight that can easily be flicked off and on. It works best with a small flashlight with a beam that is not too bright and easy to spot. Select one person to be “it” and then have them run and hide in the dark. This person is the “firefly” and can move from hiding place to hiding place flashing their light every minute or so. The other players race around to find the firefly. When they catch them, the game is over. The first person to spot the firefly is “it” for the next round. This Bocce set was made to play after the sun goes down so it’s perfect for your backyard once Daylight Savings ends. The balls are made from a durable plastic that is translucent so the LED light shines through making them glow-in-the-dark. Once you throw them, you can still easily see them from 100 feet away. The set includes eight glowing bocce balls – two green, two blue, two red, two yellow, as well as one glowing jack and a nylon carrying case with handles. It also includes batteries, instructions and, most importantly, a tape measure so there are no feuds over who won the game. When you need an activity to get some energy out of your kids, Glow Battle is a great go-to. It is perfect for dark nights, easy to set up, and way more fun than staring at a screen. Players use harmless, glowing swords to team up and attack down their opponents, and send them running back to their base to “recharge” before they get hit again. If your child loves lightsaber toys, he/she will love our glowing Glow Battle swords. Teams are distinguished with light-up bracelets and bases are marked with LED lights. This game incorporates teamwork with strategy, and futuristic lights to make it a fun choice, either outdoors or indoors where you have some open space. Available here. You can make just about any outdoor game more fun with a package of glow sticks. Volleyball is the perfect example. Give all of the players four glow sticks – one for each wrist and ankle. Then, activate a few more glow sticks and insert them into a blown up beach ball. You can play with a net like a real volleyball game or just in your yard where you have space. Watch their excitement as the kids pass the glowing ball back and forth to each other while trying not to let it touch the ground. Kids will be so excited when it starts getting dark earlier if they have their own headlamps to wear. You can find them at major retailers like Walmart or Amazon and you can purchase them individually or in multi-packs. You can use them to play any variation of tag such as freeze tag where players divide into teams and try to freeze as many players as they can on the other team until there’s only one team left standing. Regardless of how you play, headlamps are a great way to have fun at night and a great incentive for kids to get out and get moving. Some classic games really are more fun in the dark, and this is one of them. It’s the classic Capture the Flag game revolutionized with futuristic glow-in-the-dark lights. Players split into teams and then work together to break teammates out of jail, sneak into enemy territory, protect base and steal the glowing flag to win. Each game box includes two glowing orbs to use as the “flags,” color-coded LED bracelets to differentiate team members, glowing jail markers, and a rulebook. As an extra bonus, each kit includes 12 game variation cards that offer even more ways to play Capture the Flag, as well as other games. Available here. The perfect outdoor game for older kids and teens, Jazzminton is the ultimate paddle ball game. And, you can purchase extra LED birdies that you can use to play it in the dark. The kit includes two fluorescent wooden racquets, two yellow birdies and two red birdies. It allows you to play a slow and easy game with the yellow birdies or a fun and faster game with the red ones. Look for the game and the birdies here. Don’t panic about the end of Daylight Savings Time. If you plan ahead and are ready for the longer nights, you just might find some really fun new activities for your whole family. Once you move back those clocks, be ready with a supply of glow games, activities and a little creativity. Just about everything is more fun when it glows. Glow sticks and music are great for a glow in the dark dance off, neon duct tape or glow in the dark paint are an easy way to make a game of neon hopscotch or tic tac toe. Before you know it, their sleeping schedules will be back to normal. Keeping kids and teenagers outside and active as the weather turns cooler is a challenge for parents. It’s often hard to find fun games and things to do in the long, cold and dark months of fall and winter. The shorter days and colder temperatures can lead to spending more time inside on screens, getting less activity and other unhealthy habits. When cool weather hits, you can find pumpkins and gourds in every store or market. Purchase some extra for fun backyard games like Pumpkin Ring Toss and Pumpkin Tic Tac Toe. For the ring toss, place medium to large pumpkins at various distances away from the throwing line. Then, give each player a set of five plastic rings to throw. The pumpkins that are further away are worth more points. And, you can use the smaller pumpkins and gourds to play outdoor tic tac toe using sticks or chalk to mark your boards. You don’t need an actual sporting event to host a tailgate in the fall. Set up your backyard with some fun tailgate activities like corn hole, lawn darts, ladder toss, and horseshoes. Have everyone wear their favorite team shirt, set up a card table with some fun snacks and enjoy your day outside with your family. You can even hang some party lights from poles so that you can continue your backyard tailgate way into the evening. When the days start getting shorter, it’s the perfect time to play outdoor glow-in-the-dark games like Capture the Flag REDUX. It’s the classic Capture the Flag game revolutionized with futuristic glow-in-the-dark lights. Grab some neighborhood kids and watch them get moving as they break teammates out of jail, sneak into enemy territory, protect base and steal the glowing flag to win. Each game box includes two glowing orbs to use as the “flags,” color-coded LED bracelets to differentiate team members, glowing jail markers, and a rulebook. As an extra bonus, each kit includes 12 game variation cards that offer even more ways to play Capture the Flag, as well as other games. Available for purchase here. Once the cool weather hits and the pool is no longer an option, use the pool toys for some additional outdoor fun. Divide into two teams and give each player a pool noodle. Use a beach ball as the puck and designate goals with lawn chairs. Then, let each team have at it while they use their noodles to get the ball into the other team’s goal. It’s a silly twist on hockey and a fun way to get kids of all ages moving. Score big with your kids in the fall with this LED lit ball for a fun glow-in-the-dark game of flag football. Even after the sun goes down, you can keep playing with this durable football that features bright red LED’s built right in with a 3 minute timer that triggers when the ball is kicked. Each ball comes with an inflator needle, two LED light modules, two round rubber light covers, and installation tool and instructions. Batteries are replaceable with 3 – AG13 button batteries. Available for purchase here. If the temperature drops enough, this is a fun game to play, as well as a good lesson in science. All you need are some empty water bottles, a pack of balloons and gloves for all of the bowlers. Use plastic buckets to set up a “golf course” around your yard. Number the buckets from one to nine. Then, each player takes a turn throwing the frisbee toward the numbered “hole” just like in golf. The players try and make as few throws as possible to land the frisbee in the bucket. At the end of all of the holes, the player with the lowest score is the Freezin’ Frisbee Golf Campion. There are some games that can be used in the day, in the night, in warm weather and in cold weather, and this is one of those games. You can play Glow Battle inside in a dark room, outside after the sun goes down, and in any weather – anywhere that you have open space. Players use strategy, teamwork, and their own warrior instincts to team up and take down their opponent using harmless, glowing batons. Teams are designated by different colored LED bracelets and have a base to “recharge” after they get hit. It’s a fun and exciting glowing game that incorporates activity with strategy. Available for purchase here. Do you have any other fun games for cool weather? If yes, please share them in the comments below. The featured image used in the blog post can be found here. It’s Halloween party time, kids are coming to your house and the thought of how to entertain them is the scariest thing of all! Don’t fear, there are so many exciting and fun ways to keep your young party guests entertained and out of trouble. You just need to start with a good game plan, have your supplies ready, and be flexible if the game plan changes. It’s a great idea to include some active games alongside some that aren’t as active so that kids can get some energy out and still have time to wind down. Since so many Halloween parties take place at night, it’s also smart to have several games that your party-goers can play when the sun goes down. This list of thrilling and chilling Halloween games for kids is the perfect spell for a spooky party. You probably have the supplies for this one already. All you need are several packages of toilet paper, one roll for every two kids playing. Split your group into partners and have one of them wrap up the other like a mummy in toilet paper. Race to see which team finishes first, completely wrapping their partner from head to toe. You can also play this game as a relay race and have one member race down from a starting point with the toilet paper to wrap the mummy, and then have the wrapped mummy race back to a finish line, just be sure that the mummy can see and move easily. If you need an inside activity, this is the card game to pick for endless and unbelievable combinations of “Would you rather…?” scenarios. You won’t believe how crazy some of the choices are and what conversations will be sparked! When players have to decide between horrible and annoying choices, the game turns hilarious. For an added Halloween effect, place the cards in a black plastic witches caldron and ask the players to “Pick your poison.” This game is available here. This game is a neighborhood favorite and perfect to play at a Halloween party. When evening rolls around and your kids are looking for some spooky fun, pull out some flashlights and send them outside. Just make sure you have as many flashlights as there are players. Designate one player as the “ghost” and have them hide in the yard while the other players first count to thirty and then search for them with the flashlights. The player that finds the ghost yells, “Ghost in the graveyard!” and all of the other players run back to the base before the ghost can tag them. The first player that is tagged becomes the ghost for the next round. Keep those flashlights out for this next sweet game. Open up a box of sandwich baggies and put a different candy bar or handful of candy in each one. Then, loop a glow stick through the top of each bag. Hide all of the bags in your backyard, divide your party-goers into groups of two or three, give them a sack or plastic pumpkin container and a flashlight. Then, let them go on a nighttime candy hunt. Whichever group finds the most candies, wins. It’s also fun to play some spooky music while they hunt. Nighttime glow games are the perfect ways to keep Halloween party guests entertained. And, there’s no better way to get your party moving than this twist on the classic Capture the Flag game. Split into two teams designated by different colored LED bracelets and mark your team boundaries with futuristic lights. Then, each team begins the hunt for the glowing orbs or “flags” and can catch opponents and lock them in jail with glowing jail markers. This game is perfect for any aged Halloween party – kids, teens, adults. The set comes with all of the mentioned glowing gear, a rulebook and 12 game variation cards to keep the games interesting. Available for purchase here. Kids love making noise almost as much as they love making a mess. This game allows them to do both. Blow up a large package of orange balloons, and hide prizes in them before you tie them off. You can either insert fun treats like glow sticks, small candy packs, inexpensive gift cards or funny tricks like shaving cream or jell-o. Then, put them outside in an open space to make a pumpkin patch of orange balloons. Let the kids stomp away to reveal the hidden surprises and make a big loud mess! While the kids are outside making a mess, pull out these scary ingredients for the next messy Halloween game. You’ll need small paper plates or cupcake wrappers. In each one, add a small quantity of slimy food like gummy brains, peeled grapes, cold spaghetti, jell-o, or tofu. Then, blindfold the players and have them eat the food and see if they can guess what they are eating. If your Halloween party starts to turn lame, this light-up battle game is an awesome way to add life to the party. You can play Glow Battle inside in a dark room or outside after the sun goes down – anywhere that you have open space. Teams are designated by different colored LED bracelets have a base to “recharge” after they get hit. It’s a fun and spooky glowing game that incorporates activity with strategy, Available here. Anyone can bob for apples, but only the really fun Halloween parties let you bob for worms. For each player, prepare a paper plate with five gummy worms that you cover heavily with whipped cream. Then, make each player keep their hands behind their back and find the worms with their teeth. Without using their hands, they have to pull the worms from the plate and place on the table. The person that finds all five of their worms first, is the worm winner. Do you have any great fun scary games for Halloween that you’d like to share? If yes, please let us know in the comments section below and HAPPY HALLOWEEN from Starlux Games! What can the best outdoor games for fathers and sons do for a relationship? Help the chances for dads and their boys to be best friends. Kids often find their best friends through games. So dads should make sure they get involved in games with their sons. Being a great dad is the goal. Becoming the best friend of a child is an epic bonus. So what are the hallmarks of the best outdoor games for fathers and sons? Most of the ones we found involve some sweat equity! And dirt. Both are excellent for bonding. Before we get to the games that make for better dad/son ties, we have to admit that there is a place for video games here. Playing games like Call of Duty with my kids and their cousins was some of the best times I recall with sleepovers at our house. The laughter and excitement of playing together for hours will never be forgotten. Dads can meet their kids halfway on video games to show they are interested in the kid’s hobby. Then the child is more likely to try outdoor games suggested by their pops. Since we are talking about Call of Duty type gaming, then playing paintball is a terrific outdoor game. Boys who love to shoot up the enemy on-screen will love doing it in the real-world with paintball guns even more. Digital gaming is exciting, but it is based on real-world battles. So naturally the physical version of these shootouts is better than the simulation. And it gets both the dad and the son more active. Burning calories with paintball is tons more fun than boring treadmills! If paintball is not an easy option, then laser tag may be a better outdoor game option. We often see this game played indoors but it works outside as well. Boys and their dads can play against each other. But even better, they can challenge other dad/son teams in their neighborhood, church group, or Boy Scout troop. Laser tag is not as costly as paintball, making it a more budget-friendly option. We must mention two Starlux games that are perfect for father-son gaming outdoors. Glow Battle can be played with just two people in order to practice for larger group battles. Think Luke Skywalker training with his old man Vader. Capture the Flag Redux is the other option for father/son fun time. They can easily get their friends and their dads to play this game at camps, church, or at the local rec. department with members of their sports team. Like to keep it simple? Then catch is the game that involves no competition, just a basic physical activity that is conducive to good conversation. Those who have tossed a football or baseball around with their own dad can remember how easy it was to talk during catch. Conversations are hard in the middle of a movie or with a headset on playing video games all the time. Golf can take a bit more money to get involved with, but who knows… the kid could get on the PGA tour one day! Doubtful, but it’s cool to wish out loud. Regardless, it’s better for fathers to bond with their young ones over 18 holes than to end up millionaires. Money doesn’t solve every problem. Just ask Tiger Woods. He would have given up all his cash for a few more years with his dad. On the opposite side of golf is a game that still takes patience and concentration. Archery is tailor-made for dad and son bonding. It’s a great skill to have for hunting of course. But also for a possible zombie apocalypse. Playing against zombies on Call of Duty doesn’t really prepare people for the worst! Being able to place an arrow in the bullseye does put a father and son team in a good position save humanity one day. Let’s hope it doesn’t come to that. The last mention on our list of the best outdoor games for fathers and sons is a tough one… adventure racing. These involve challenging races that can make a marathon look like a walk in the park. These events are not on every corner so some travel may be needed. It would be worth it for dads to kayak, run, and bike with a son to see what they are made of as a team. If adventure racing is too hard to find then there is another option. Spartan-type races are more common and affordable. Getting dirty climbing over walls and under barbed wire is what dads and sons were meant to do, right? If you have a story about a game or outdoor adventure that strengthened the bond with your father or your son, we would love to hear about it. The featured photo used in this blog post is by U.S. Air Force Master Sgt. Dachelle Melville/Released and can be found here.